Geotextile Tubes | GeoForm International Inc.
What Are Geotextile Tubes Used For? Dewatering is an important step in the sediment removal process. Dewatering removes the water from the solid sludge or other material to prepare it for disposable. The dewatering tubes “squeeze” the sludge as it passes through, which filters the water out through the fabric material. The dried sludge is then excavated from the tube and transported to the disposal site. GeoForm International carries well-constructed geotextile fabric tubes that are perfect for dewatering materials of all types. The geotextile tubes used with our dredges are made and manufactured by one of our partners, Envirotubes. Geotextile is a resilient, permeable fabric that can separate, filter and drain water from sediment. These geotextile fabric tubes exhibit the high strength and robust capacity to meet the demands of waste water treatment projects, industrial lagoons, pulp and paper mills and small to mid-sized ponds. The use of Envirotubes dewatering tubes at your job site will enable you to execute those smaller pumping and dredging projects that are impractical for other types of heavier, bulkier equipment. These dewatering tubes ensure the appropriate flow rates and operating pressures for the job. When used with the Dino6 dredge, the dewatering tubes give you the benefit of a powerful, efficient sediment removal system that will save you time and money. 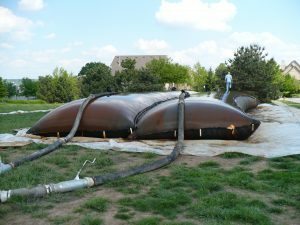 Contact us to learn more about our made in the U.S.A. sediment removal products!